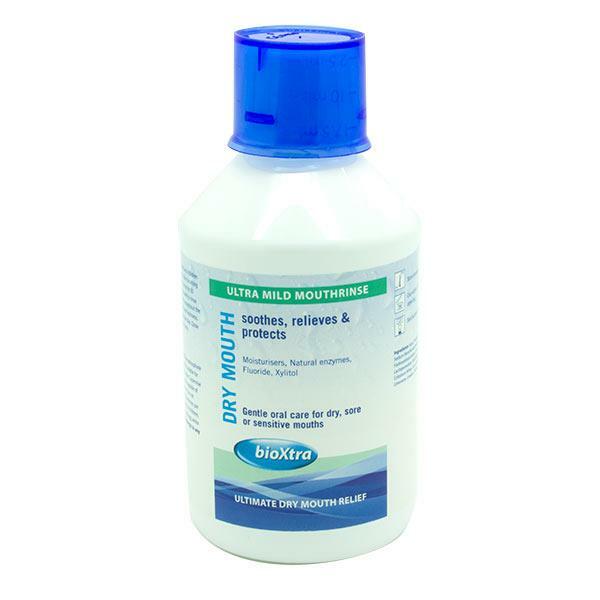 BioXtra Ultra Mild Mouthrinse for Dry Mouth supplements natural saliva. It helps to maintain the mouths natural balance while cleansing and lubricating it. The mouthrinse also protects against dental caries and eases the symptoms of dry mouth. For best results it is recommended that it is used as part of the Bioxtra daily oral care programme. Adults and children 7 years and older. After brushing teeth, use approx 10ml, rinse for 30 seconds and spit out. No need to rinse with water. Use regularly throughout the day to maintain comfort and freshness. Do not exceed five times per day. Close cap after use. For oral use only.